It has often been said that the Spirit of Prophecy is as a pilot, guiding a ship through treacherous waters in the last days. What a gift of love the Lord has given His people, a source of truth and knowledge designed especially to be a safeguard helping anyone who should care to share in its purpose! Its purpose is simply to help us through the perilous waters that we find ourselves in. And its method of piloting is to guide the reader back to the Bible, to help the reader understand, and be led by the Holy Spirit, unto that glorious day of His appearing. We must sanctify ourselves and our households to God. We must bring Jesus into our hearts and our homes, and we must seek every day to instruct others in regard to the claims of the law of God and the plan of salvation, that they may have a knowledge of Jesus (RH, July 29, 1890). The warning found in this passage alerts the reader to a necessity, not a suggestion. It highlights the truth that sanctification is a requirement of the Lord. It is a requirement of the Lord that all who will be saved in the last day must be set aside as holy. Sanctification is, simply put, being made holy. We must, by the Lord’s grace and power, be made holy to be saved! As we will see, this truth found in the Spirit of Prophecy compliments the truth of Scripture. Moses was 80 years old when he returned to Egypt to lead the captives of Israel to freedom. For 40 years Moses lived and reigned as a prince of Egypt. For 40 years he lived as a shepherd in the country of Midian, where he there married and raised a family. He was a very old man. Then to top it all off, he wandered the wilderness for another 40 years before he finally died at the age of 120 years old! The loss of Moses must have been a devastating blow to the nation of Israel. Not only was Moses a beloved leader—one who had led the nation through thick and thin, one who had been God’s messenger—but he was also a walking miracle, reminding them every day of God’s sustaining power. He walked among them from 80 to 120 years of age in a time when most men died at 40. The children of Israel deeply mourned his passing, and 30 days were set aside to remember the life of their leader. It is possible that the children of Israel didn’t fully realize the value of Moses until he was taken from them in death. Sister White writes, “With a new and deeper appreciation they recalled the precious lessons he had given while still with them” (PP, 481). Although Moses was dead, his influence still lived on in the hearts of those who loved him. To this day, his influence is felt around the world. Poetically written, the Spirit of Prophecy reads, “Moses was dead, but his influence did not die with him. It was to live on, reproducing itself in the hearts of his people. The memory of that holy, unselfish life would long be cherished, with silent, persuasive power moulding the lives even of those who had neglected his living words. As the glow of the descending sun lights up the mountain peaks long after the sun itself has sunk behind the hills, so the works of the pure, the holy, and the good shed light upon the world long after the actors themselves have passed away. Their works, their words, their example, will forever live. ‘The righteous shall be in everlasting remembrance.’ Psalm 112:6” (PP, 481). Moses had fallen asleep in the Lord. Joshua was the acknowledged leader of Israel. God commissioned Joshua to lead the Israelite nation into the Promised Land (Joshua 1:2-9). And the people replied, “All that thou commandest us we will do, and whithersoever thou sendest us, we will go. According as we hearkened unto Moses in all things, so will we hearken unto thee: only the LORD thy God be with thee, as he was with Moses” (Joshua 1:16-17). The history of Israel was to be placed on record for the instruction and warning of coming generations (PP, 420). Hopefully, through this study, we will be able to see that what happened to the Israelites on the banks of the Jordan is what will happen to us. History has a habit of repeating itself, and it is no coincidence that what happened to literal Israel often finds its ultimate fulfillment and application in the experience that you and I are living as spiritual Israel. God gave Joshua strict instructions concerning the crossing of the Jordan, and the long-awaited entering of the Promised Land. But, how were they to cross the Jordan? The waters were at flood level, and there where no bridges for the Children of Israel to use to cross. God had given Joshua all the details of the crossing of the Jordan except where to cross. However, Joshua reasoned in his heart that if God had given so many instructions, surely He would provide the passage. Joshua told Israel that it was time to cross the Jordan. Leaving their camp in the acacia groves, with supplies enough for three days, the Israelites descended to the banks of the Jordan, and there set up one last temporary camp east of the Promised Land. And Joshua said unto the people, Sanctify yourselves: for to morrow the LORD will do wonders among you (Joshua 3:5). Joshua said to the people, “Sanctify yourselves!” He was saying, consecrate yourselves to the Lord. See if there be any wicked way in you and remove it. Make yourselves holy in the Lord, because tomorrow we cross over into the Promised Land. This is important! The Children of Israel were to sanctify themselves before they crossed over into the Promised Land. And it came to pass after three days, that the officers went through the host; And they commanded the people, saying, When ye see the ark of the covenant of the LORD your God, and the priests the Levites bearing it, then ye shall remove from your place, and go after it. Yet there shall be a space between you and it, about two thousand cubits by measure: come not near unto it, that ye may know the way by which ye must go: for ye have not passed this way heretofore (Joshua 3:2-4). The details of this crossing were very important. Surely, if they were not important, Joshua would not have wasted his time giving them. Sister White writes, “At the appointed time began the onward movement, the ark, borne upon the shoulders of the priests, leading the van. The people had been directed to fall back, so that there was a vacant space of more than half a mile about the ark. All watched with deep interest as the priests advanced down the bank of the Jordan. They saw them with the sacred ark move steadily forward toward the angry, surging stream, till the feet of the bearers were dipped into the waters. Then suddenly the tide above was swept back, while the current below flowed on, and the bed of the river was laid bare” (PP, 484). Everyone watched with baited breath to see what would happen when the priests bearing the Ark reached the raging waters of the Jordan River. Then, just at the moment that the priests dipped their feet into the waters of the Jordan, the raging currents were stopped upstream, and the remaining waters flowed downstream, and there, in the middle of the river’s bed, stood the priests holding the Ark, standing on dry ground. When the people had all passed over, the ark itself was borne to the western shore. No sooner had it reached a place of security, and ‘the soles of the priests' feet were lifted up unto the dry land,’ than the imprisoned waters, being set free, rushed down, a resistless flood, in the natural channel of the stream (PP, 484). Finally, after 40 years of wandering in the wilderness, the Israelites were standing on Canaanite soil! Remember the words of Inspiration saying, “The history of Israel was written for our admonition, upon whom the ends of the world are come.” How can we apply the experience of the Israelites crossing the Jordan to our experience as Spiritual Israel? I believe that we are living in the last days of Earth’s history. I believe that we are about to end our wanderings in the wilderness of this sinful world. I believe that we are soon going to cross over into the heavenly Canaan. As we are on the verge of such a crossing, it is interesting to note that the experience of the crossing of the Jordan by the ancient Israelites parallels what our experience will be. 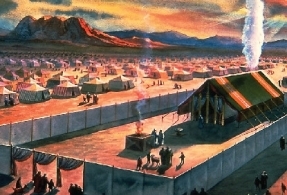 Joshua 3:3 says, “And they commanded the people, saying, When ye see the ark of the covenant of the LORD your God, and the priests the Levites bearing it, then ye shall remove from your place, and go after it.” The ancients were told that in order to cross the Jordan they had to follow the Ark. The Ark of the Covenant was the visible representation of God to the children of Israel. To them it represented God’s mercy, character, and justice. God’s people in the last days will follow God’s mercy, character. They keep the commandments of God and the faith of Jesus. The Ten Commandments are a transcript of God’s mercy, character, and justice. God’s people, in the last days, will have not discard God, but embrace Him. “These are they which were not defiled with women; for they are virgins. These are they which follow the Lamb whithersoever he goeth. These were redeemed from among men, being the firstfruits unto God and to the Lamb” (Revelation 14:4). Next, let’s look at Joshua 3:5: “And Joshua said unto the people, Sanctify yourselves: for to morrow the LORD will do wonders among you.” The Israelites were to sanctify themselves before they were able to enter the Promised Land. Surely, if they had to sanctify themselves before entering Canaan, we are to sanctify ourselves before we enter heaven. “Sanctify them through thy truth: thy word is truth. As thou hast sent me into the world, even so have I also sent them into the world” (John 17:17-18). Acts 20:32 says, “And now, brethren, I commend you to God, and to the word of his grace, which is able to build you up, and to give you an inheritance among all them which are sanctified.” The inheritance—the heavenly Canaan and the Earth made new—are for the sanctified. Just as the waters of the Jordan were rolled back to allow passage to Canaan, so too will the expanses of the heavens be rolled back to give us passage to the heavenly Canaan. And the heaven departed as a scroll when it is rolled together; and every mountain and island were moved out of their places. And the kings of the earth, and the great men, and the rich men, and the chief captains, and the mighty men, and every bondman, and every free man, hid themselves in the dens and in the rocks of the mountains; And said to the mountains and rocks, Fall on us, and hide us from the face of him that sitteth on the throne, and from the wrath of the Lamb: For the great day of his wrath is come; and who shall be able to stand? I guess this is the sad part of the story. When everyone had crossed over, and the priests had left the dry bed of the Jordan, no sooner did the soles of their feet touch dry ground, that the waters of the Jordan returned sealing the passage to Canaan. When Jesus comes again the sky recedes as a scroll. When Jesus comes again He will be King of Kings and Lord of Lords. He will gather His elect from the four corners of the Earth, and take them to heaven. There will be no second chances for those who rejected Christ by choice or action. The passage to the heavenly Canaan will be sealed. He that is unjust, let him be unjust still: and he which is filthy, let him be filthy still: and he that is righteous, let him be righteous still: and he that is holy, let him be holy still. And, behold, I come quickly; and my reward is with me, to give every man according as his work shall be (Revelation 22:11-12). I believe God’s Church is camped on the banks of the Jordan, our last encampment. The exact date of Christ’s return is not known to me or to you, but I have confidence in saying, as Joshua did, that we are going to cross over into the heavenly Canaan on the morrow, meaning very soon. What were Joshua’s personal words of instruction to the Children of Israel? Sanctify yourself. What are the words of Jesus to each of us as we prepare to enter heaven? Sanctify yourself.